Additive manufacturing (AM) is the process of adding layers of material — most commonly plastics or resins, and increasingly metals — to produce products according to precise digital plans. With AM, products are produced using only the material necessary, therefore minimizing scrap. Modern digital technology is transforming every industry, including manufacturing. 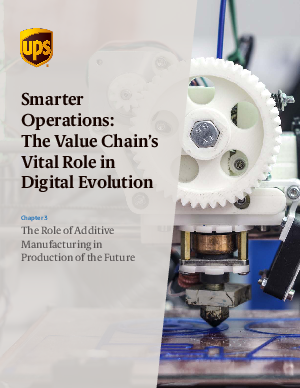 Yet in The Rise of Smart Operations, a survey of machinery manufacturers conducted by UPS and IDC, roughly one-half of the respondents said their digital or “smart” operations were lagging the competition or were at a significant disadvantage. Manufacturers will also find practical solutions they can consider implementing today to incorporate smarter operations in their production processes of the future. Download chapter 3 of UPS' four part series on Smarter Operations.